These observations took place during the 2003 Mars opposition near Mt. Wilson California. I have tested dozens of really high end scopes, but there were a few that really caught everyone's attention. On this particular night, there were about ten to fifteen of us. A buddy of mine named Henrik asked me if he could tag along on this run. This would be his first time to ever look through a telescope. Seeing on this night was 8-10. In other words, a great night. Some important people were present. John Pons, probably one of the most experienced planetary observers in the world, Steve Kennedy of Kennedy Optics as well. There were two of his 24" F-4.6 dobs at the site. This guy is an absolute fanatic with optical perfection. Both of these scopes literally punch out perfect looking star tests on both sides of focus after cooling. Ed Grissom would also be present with a 13.5" F-6 housing another one of Kennedy's mirrors. More about Grissom later. Observations began at about 10pm. My friend Jorge had his 8" F-9 TMB apochromat set up on a Losmandy HGM200 mount. Jorge uses an AP Maxbrite diagonal along with a Zeiss Badder bino and prefers the TMB monos. For my first observations, I must have spent a good 30 minutes viewing through the TMB. Let me start by telling you that the images in this scope are absolutely world class. The sharpness and contrast of the globe of Mars were absolutely gorgous and the image were totally aesthetic. We were at about 400x. Jorge and I were studying a feature called Hellas Planitia which hangs just below Syrtis Major. I could make out all kinds of markings. My buddy June had his C9.25 set up next to it, but it was being overwhelmed by the images of the TMB. The C9.25 was really good but wasn't quite as sharp and contrasty as the TMB. 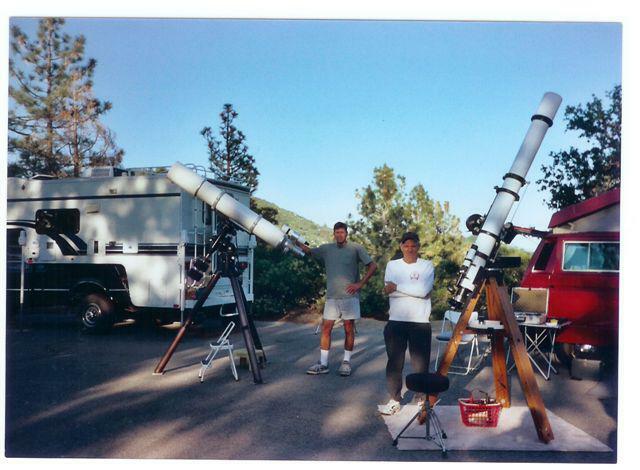 At about this time, most of the group was crowded around the 24" scopes. Body heat can sometimes be an issue but everyone understands this at Charlton and stays clear enough. I decided to step over and see what was going on. Kennedy was using a Denk bino along with an ND filter and a pair of classic Clave's which Pons loaned him for the evening. Kennedy had to be somewhere in the neighborhood of 600x. As I climbed up the ladder and peered into the eyepieces, the view of Mars nearly blew me off the ladder! It must have been about the apparent size of a nickel held up close. The color and detail was absolutely staggering! What was even more incredible was that the actual contrast of the features themselves was unbelievable! Another friend of mine said he didn't realize big dobs could produce images like this. I then understood why everyone was waiting to peer through the 24". I still couldn't get over it. I mean the color and detail just shot out at you like a picture in a book. After climbing back down the ladder, Pons asked me what I thought about the images of each scope. Before I answered, I went back to see Jorge at the 8" to regain my true thoughts. Here was Jorge with nearly a $30,000 rig in a corner all by himself. I mean anybody with experience in this area would have killed at the opportunity to look through an 8" apo like this, especially on this night. Pons came over and the three of us discussed the images. Pons told me that if you look real carefully in the TMB, you'll see all the details you're seeing in the 24". I decided to compare the images again on this particular night. After going back and forth a couple of times, I agreed. The truth is, is that you can actually make out the same details, but your eyes had to be trained more to see it. The only difference is that it just doesn't shoot out at you with as much color and authority as the 24". But which image did I actually like between the two? As far as detail and color, the 24" outperformed the 8" apo clearly, but it came at a cost. The reason for this is because it was not quite as sharp looking. There was some scintillation around the limbs of Mars and it was hard not to see the diffraction spikes bleeding off the limbs as well. So, even though the color and detail was there, I was still reminded that I was actually looking through a telescope. I guess you would call it quantity over quality. The apo gave a view that was more like you were looking out the window of a space ship. It was more pretty to look at. Let me tell you, the 8" was no slouch. I think most people just want instant gratification, but a skilled observer would be fine with the 8" apo. My thought was that it would be really nice if the 8" could produce the color, brightness, detail and image scale of the 24" and retain it's sharp, contrasty images. On the other hand, it would be nice if the 24" could keep all its detail and color but have the sharp aesthetic looks seen in the apo. It was like each scope had something the other didn't, but I'd still have to say the 24" was the destroyer of worlds that night. At this point, we had almost forgotten that Ed Grissom had his scope just about cooled down. He was a little late that night at setting up. To tell you the truth, I was not surprised people were not asking him for a look through his scope yet. I mean this thing looks like a piece of junk! It has an old, beat up looking sono tube, which sits on a big old German EQ mount. Grissom uses an old Tuthill binoviewer and an old set of the original Televue plossls which are actually my favorite planetary eyepieces of all. Ed said his scope was ready if I was interested in having a look. He must have been somewhere around 500x. As I climbed up the stool an peered into the bino, nothing would prepare me for the mother load of all images that night. It would have such a profound impact on my memory, that I already knew within five seconds of seeing Mars, which scope clearly gave the most incredible views that night or any other. It was the best view of Mars I had ever seen, even to this day. I mean it was just so unreal! The globe was literally etched like a piercing sabre! The color, definition, contrast and detail was absolutely incredible! Appearing like a steel ball-bearing from a pinball machine. My dreams had been answered and it was the real space ship effect. I would describe the image as combining all the things the other two scopes had all into one package. Ed is such a humble man, God bless his heart. What I love so much about him is that he blows people away without even trying. It is so sad that he has never recieved the credit he truly deserves as an ATM. I believe he's the best in the world with Newtonians. He misses nothing! It's the way he does it and these curved spiders of his are just so beautiful to look through. Later that night, my friend Henrik came over to me and said, I don't know what kind of scope that is over there, but that one's got the best images here. He was pointing at Ed's scope. I'm telling you guys, don't be fooled by bad looks. It's what's inside the eyepiece that counts. I asked Grissom, what the heck he does to these Newtonians and it's very simple. If you're interested to know, I'll tell you, but the man's a genious. Anyway, there you have it. Here's a pic of Jorge and Pons. The scope on the right is a 5" F-12 D&G. This is a pic of Kennedy on a different day at Pinos, but this is the 24" F-4.6 he brought up to Charlton that night. Stay tuned. Tomorrow, I will post a shoot-out of Pons's 10" F-16 Zeiss apo against another super planetary Newtonian designed exactly the same as Ed Grissoms, except this one is only an 11.75" F-6.4. Here's the 11.75". I'll explain the size later. That was a very interesting report, Daniel. I too would like to know how the "teeny" 13" could have beaten up the 24-incher so badly? 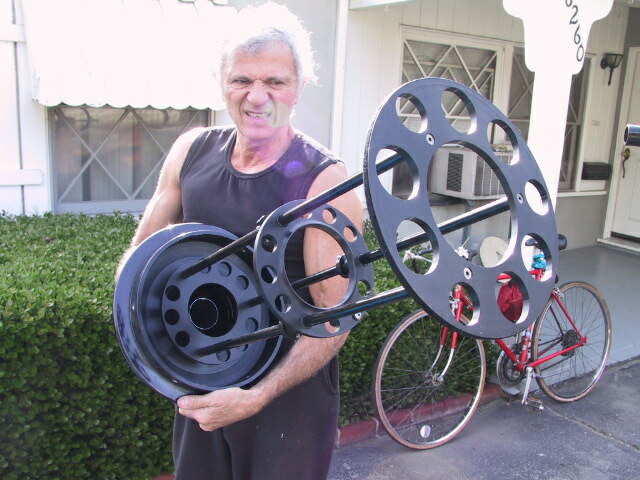 What I find interesting is the cost difference between the 8" APO and Ed's reflector. I always believed that "ingenuity" will match or beat money. That 8" APO is a scope any of us would "slobber" over, but the skill and workmanship of someone like Ed G. is an inspiration. I think the most important part of this post is to help remove some of the stigma on the topic. 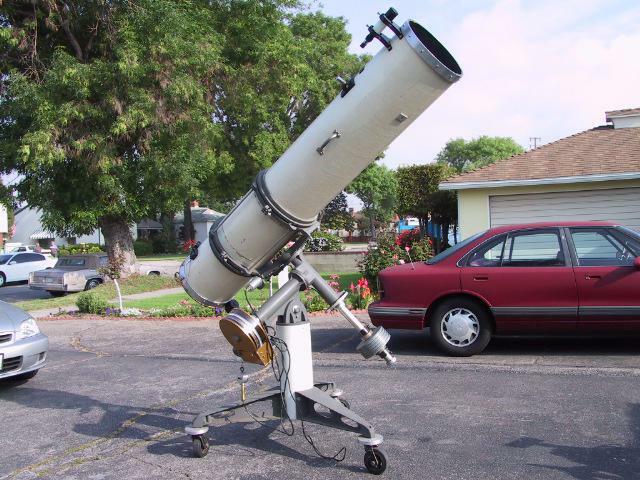 I think once refractors get passed 6" in aperture, they're just simply too big to lug around and the truth is, is that if you can get a 10" or 12.5" reflector for much less money as well, your still gonna wind up with a better instrument for visual planetary work. I strongly believe that the failure to see or realize this fact comes from faulty execution of the reflector design. If all the gremlins are kept at bay, you will get results. Some people dream of 15" apos, but it simply can not work that way. In order for such a beast to work, it would have to be kept at a constant ambient air temperature inside an observatory and even then, I believe the optics would probably be undercorrected at all times. I just don't believe it could work and to tell you the truth, it wouldn't matter anyway, the reflector design will still be superior in every catigory of visual observations when properly designed at this point. These are not just fun scopes. There purpose for being made was to enjoy planets, but they also prove beyond any doubt that the reflector remains a force to be reckoned with. People usually relate sharpness to refractors while detail and less aesthetics are more associated with reflectors. This is absolutely not true in our case. I've seen it with my own eyes enough to be convinced of this. I've made a point to study and understand how this is. Thank you Daniel for yet another interesting report. I eagerly await your details on improving Newt performance. Great report ! Thanks for sharing !! I am pretty neutral to both refractor and reflector. But currently stuck with refractor is only for "bragging rights"
This next comparison took place nearing the end of 2003 and Saturn was the target. I'll try and make it short so I can explain how these guys get these Newts working so well. 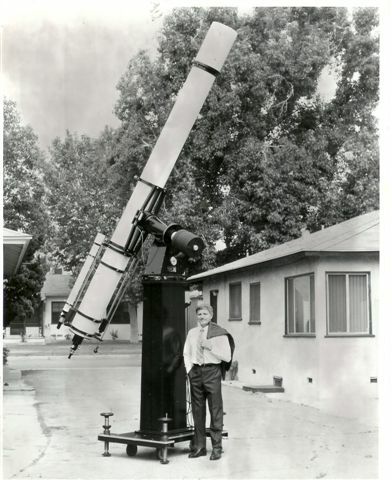 Take in mind that the 11.75" F-6.4 planetary Newt pictured above is actually a 12.5" F-6, but sadly when Pons was removing the gorgous Ed Beck mirror from the tube, one of the mirror clips was loose and the mirror slipped to the ground. Fortionatley, there were only some cracks around the edges. Pons decided it was best to mask it down to 11.75". This was going to make it even more difficult to compete with the 10" F-16 Zeiss. There were about six of us present on this night. I rated seeing a solid 9 on this evening but the transparancy is not as good as Charlton and you tend to lose a couple of points of an arc second. We had both the Zeiss and the Newt side by side, running at about 350x to 400x. Pons prefered to do the comparison using only a single eye in both scopes, granted he's got all the binoviewers one could want. Saturn was tilted at about 25 degrees or so. The first thing that literally blew my socks off was how sharp Saturn was. It looked absolutley etched! At one point I began to notice two subtle grooves residing along the inner portion of the B ring. I also wasn't sure what to make of it, but there was also a hint of the Keeler devision on the right ansa of the A ring. This is now wrongly known as Encke's devision and the minima was not present at all, but you really need a lot of magnification and angular resolution to bring this out. I've never seen it with clarity in anything less than 8". I have to say that this is the most amazing refractor I've ever looked through. There was no false color at all on Saturn. There is a little bit on Jupiter since it's brighter and the color tends to go in an out a bit depending on the seeing conditions. This is still incredible at this aperture, not to mention that the star test is identicle on both sides of focus. I think one of the amazing things about this scope is that Saturn's rings appear to take on this bizarre looking vinyl appearance. It's just amazing to see in for real, it's like being in a spaceship. a couple of the guys were over at the Newtonian at this point and I decided to step over. Take in mind that Pons and Grissom's Newts are dialed exactly the same. When I looked into the Newt, the first thing that blew me away was the color! The Ziess looked white in comparison. The subtle gredations along the globe were more obvious in the Newt. The EQ band which looks like a tiny, thin hair, was also easier to descern in the Newt. Was the image just as sharp? heck yea! Once again, these Newts just floor me! Refractors will always be beautiful, but it's hard to justify a $250,000 refractor to an $8,000 Newtonian that's beating it. The fact is, is that if you dial the Newt right, your gonna win. 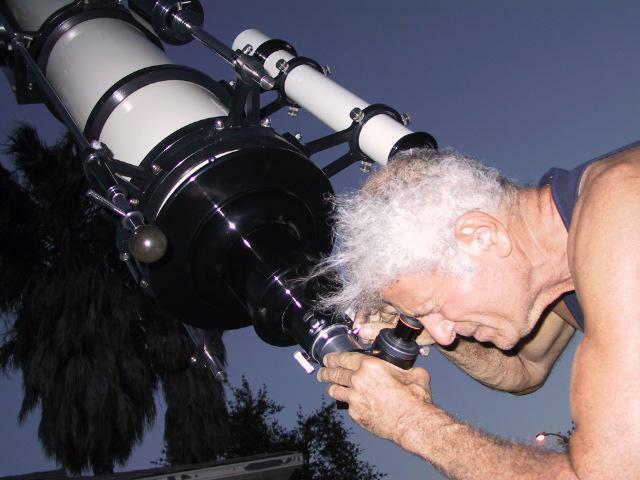 Pons has been observing planets for 50 years. He's earned the right to decide what he thinks is best and he's got the best of both worlds to prove it. When I asked him which scope he liked better on planets, he said the Newt was king, hands down and it's as simple as that. He has no shame in saying so, dispite the fact that he's spent a good part of his life and a lot of money building the refractor. People always try to challenge me in a debate. Then they look through one of these Newts and they're quickly silenced. Pons always told me that they'll always try to argue, but they'll quietly go back to their garage and start trying to build a perfect Newtonian on their own. Later I'll tell you how the Newt should be designed and built. If people want to argue numbers with me, then that's OK. You are more than welcome to pay us a visit at Charlton and bring what ever you have, but I gurantee, you'll be humbled by the planetary views of these Newtonians designed by John Pons and Ed Grissom. This disgruntled looking man is not the terminator. It's Pons struggling to hold the tri-space up. This makes up the third and final element. You can't see it because Pons left it out, but the color corrector sits in the middle ring assembly and then slides into the back of the Zeiss tube assembly. The optics up front are a two element, air spaced doublet. Thanks for the wonderful report and photos. I am in awe of these gentlemen's accomplishments. Please explain what it means to "dial in " a newt. All of those scopes have serious "drool factor" !!! I could "suffer" through owning one or two of those. the "one or two" wouldn't happen to be the refractors would they??? 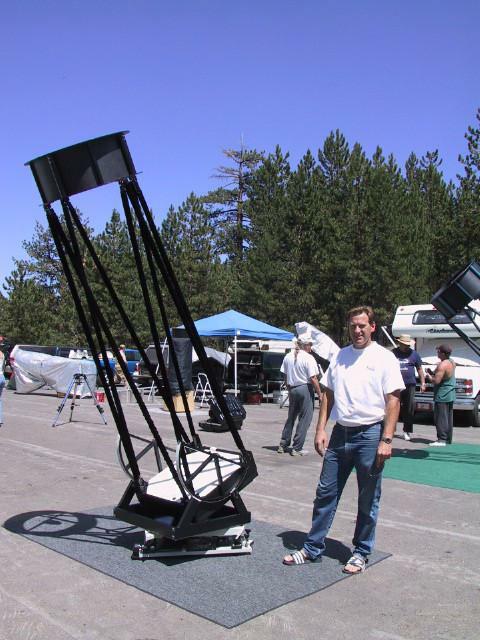 The part that I find intriguing is that a large refractor can stand up to huge, well-made reflectors, but a properly "tuned" reflector of modest size will stand head and shoulders above them all! The question keeps coming back to what a properly tuned reflector is! That has my attention too.